So what do you do when you have a lot of round scrap wood pieces????? Well we thought they would make a great wall decoration for sports enthusiasts. This is our soccer ball version. We painted the wood white, painted the pentagons black and now we have a large wooden soccer ball that is 10-1/2" in diameter. We also added a peg for hanging a hat. And of course we have to personalize this item. 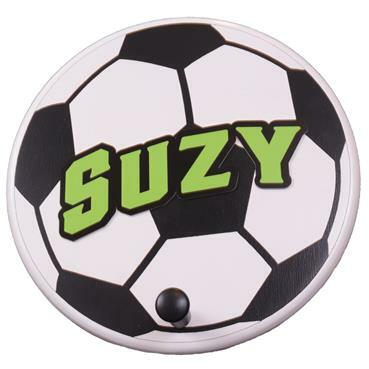 You can choose from several bright colors that really make the name pop on this soccer ball. To easily hang this item on the wall we added a keyhole to the back so it will sit nice and flush on the wall. We are even including a screw and drywall hanger!!! 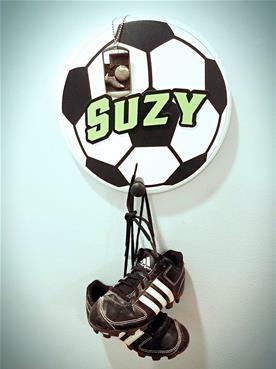 Great addition to soccer fan's bedroom or any room with a sports theme. Personalize this item with your sports fan's name. Choose from several bright colors for the personalization. Hanging is a breeze with the keyhole we added to the back and the hardware we include. Item measures 10-1/2" in diameter. This item was up-cycled from scrap pieces.